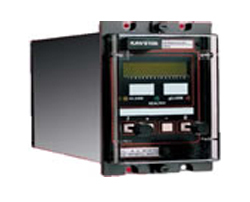 The KAVS is a stand-alone check-synchronising relay for application to feeders on transmission, sub-transmission and distribution systems. KAVS is a stand-alone synchronism check relay that can be applied on all power systems from distribution to transmission voltages. It is user-friendly and flexible in its operating logic. Part of the K relay range, KAVS is designed for use in all power systems from distribution to transmission voltages. It can be integrated into an overall protection and control system via its integral serial communications facility. KAVS checks that the voltage, phase angle and frequency on either side of an open circuit breaker are such that it is safe to close. KAVS provides the check synchronising or dead line/bus interlocks required for some auto-reclose applications, as well as split system detection. It also checks synchronising interlocks for manual reconnection following a system split. Compact, numeric KAVS relays benefit from optimal design. They are equipped with a user-friendly interface and flexible operating logic.